Hello Ladies , Today i'm going to review Dolly Wink Eyebrow Pencil no.01 Honey Brown. 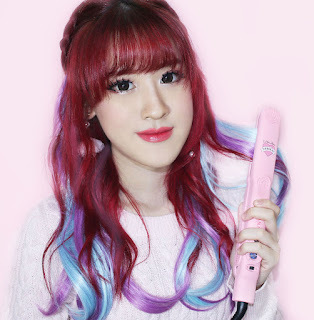 I always excited to review dolly wink product. As you might have known , I LOVE Dolly Wink and Candy Doll. Koji Dolly Wink Eyebrow Pencil has three different colors for you to match your trendy hair color. The eyebrow pencil is easy to apply and provides you a natural looking eyebrow. Koji Dolly Wink Eyebrow Pencil is waterproof and highly resistant to sweat and grease. Dolly Wink packaging always attract people to buy. Otona Edition have a simple design but still look lovely, I still love it even though it's not as cute as before cause i prefer polka dot ( old design ). The mascara brush is basically used to brush your eyebrows so they're in the direction you want and to create a more natural pattern with pencil after it's applied . You can use it to brush your eyebrows a bit after applying eyebrow mascara as well. The texture is almost powdery-like, as in soft and glides on nicely but only if your skin is smooth and dry. It's a little difficult to see if you have darker skin. I think this particular shade is for lighter skin. This pencil eyebrow has a nice pigmentation and easy to blend with brush. Here's a photo when I applied the Koji Dolly Wink eyebrow pencil. It was easy to apply coz it was very pigmented. I didn't had to reapply the eyebrow pencil on my brows. Plus, because its an eyebrow pencil, I can easily control the thickness of the lines and the heaviness of the shade on my brows. I've been using it for almost a week now and I love it . It matches perfectly with blonde hair. The pencil itself is amazing cause it's an uncommon color. Dolly Wink products never let me down. I do like how it looks on my brows, though I do think that if you want flawlessly blonde eyebrows you may need to apply brow mascara too but for me it doesn't really bother me that much because in reality, you cannot see my brows because my fringe just hides it anyway. So yes, I do recommend this eyebrow pencil. Of course!!! There's nothing I dislike about this product. It's difficult to find this shade of eyebrow pencil. You can buy Koji Dolly Wink Eyebrow Pencil 01 Honey Brown in here. Perfect review... I love the final result!!! I have read great review on this brand but have never tried any of their products myself. I think I might pick some up the next time I see them. aaa love the colour....!! but it doesn't suit me at all :) nice review beb. Great review dear! Sounds like a nice product! Beautiful make up. Nice song! It looks a great product, love your make up! thx! yes i follow You now! :) follow me back? You look splendid doll, that pencil sounds great! what lenses do u wear here? You are very beautiful and cute. I´m your new follower, follow me back, please. Kisses and hugs.